across the hall from the history of history, there was a traveling collection from the kyoto costume institute accompanied by more photographs by sugimoto that were not very inspiring. 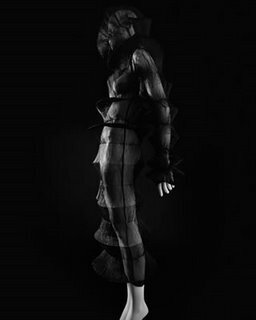 fortunately, to make up for it, the collection contained some topological clothing which was pretty cool from rei kawakubo and the miyake design lab. 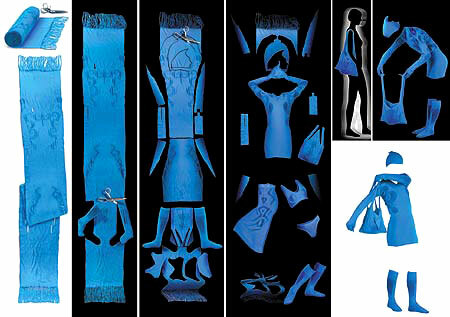 when i stumbled on a piece of cloth (by dai fujiwara and issey miyake) a few years ago, it was epiphanic. 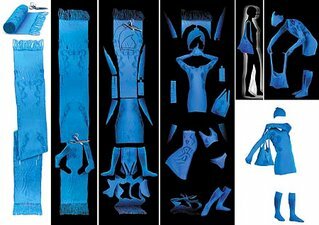 a-poc is a line from the miyake design lab employing a process designed to create fully-constructed pieces of clothing as the end-product of weaving -- they encode three-dimensionality into a two-dimensional object by careful and complex manipulation of the weave. in any case, when final forms are built into the fabric of pieces allowing only minor variations to be made to the finished work, the planning and design process requires detail, future-oriented thinking, and extensive optimization. future-oriented thinking seems to emerge in many of the iconic cultural products of japan,* so that i wonder a) if it's something cultural and b) what the genesis of the impulse was -- it's always difficult, without penetrating the hermeneutic circle, to understand whether a piece of work or a body of work represents simple expression of a culture gene or real innovation. * ise shrine in mie prefecture, for example, is rebuilt in alternating adjacent sites approximately every twenty years, a way of ensuring perpetuity without senescence. the cycles of rebuilding have continued with only a few interruptions for over 1200 years. next rebuilding is in 2013, and i have every intention of being proximate.